A deciduous tree is one that loses its leaves in the fall. Download the Deciduous Trees Activity. Answer the questions using the text below. Click here for the PDF. Black cherry has shiny leaves. The black cherry is an important tree to birds and animals because of the small black berries it produces in August. The black cherry has simple leaves (one leaf per stem) that are very shiny. Many species of butterfly and moth feed on cherry leaves when they are caterpillars. 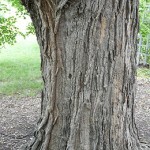 The bark of a mature black cherry has a flaky appearance and because of this it has been called the “potato chip” tree. 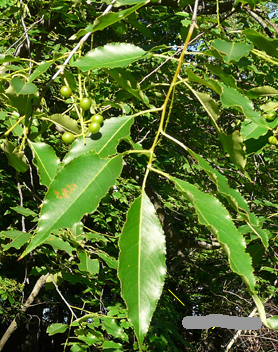 In addition, the bark of a cherry tree was used by Native Americans as cough remedy. Cherry wood is used to make furniture, like tables and cabinets. 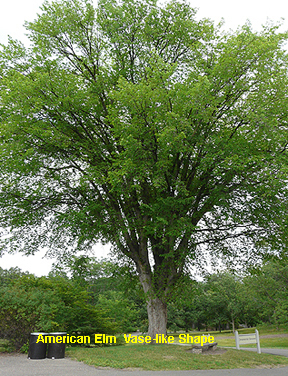 The upright branches of the American elm, gives the tree a graceful vase-like shape.Elms were planted in neighborhoods across the Midwest for more than a 100 years. Now most of the trees have been cut down because of spread of Dutch Elm Disease. However, elms will never become extinct because they produce thousands of seeds each year. Elms can live to be over 300 years old, however, it is rare to see a tree over 100 years old today. 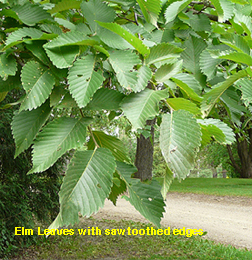 leaves of an elm feel rough to the touch. Also the leaf edges are saw-toothed. 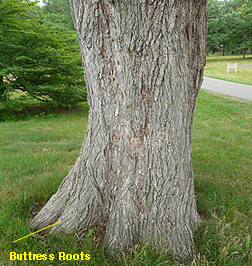 The trunks of large trees develop what are called buttress roots to support the weight of the tree. Green ash branches grow in different directions, often giving the tree a “ragged” look. 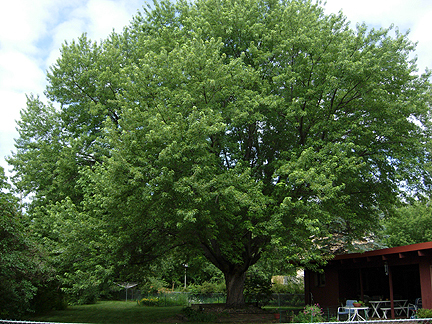 Green Ash is one of the most common trees planted in the Midwest. In nature, it is usually found in flood plains (areas that sometimes flood) growing near rivers. It is a fast growing tree which lives over 100 years. Its branches grow in many directions and give green ash trees a “ragged” look. 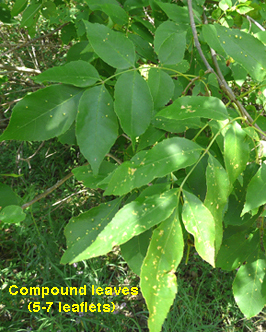 The leaf is compound (meaning that there are 5-7 leaflets on each stem). 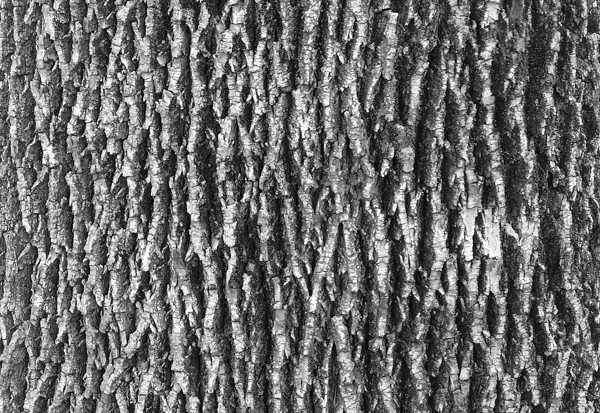 The bark makes a diamond-shaped pattern. The lumber of ash is used for paddles and tool handles. Native Americans used green ash to make bows. The roots of a green ash are extensive. For instance, a 40 foot tall green ash had lateral roots (roots that grow outward) that went out 50 feet and were 4 feet deep. The extensive roots allow it to survive during drought (no rain) years. The emerald ash borer is an insect that kills ash trees. If the tree is infested with ash borers, the canopy (top of the tree) gets thin and the tree dies. The borers attack the water conducting tissues of the ash tree. Emerald ash borers have been spreading across Michigan, Indiana and Ohio. There have been scattered reports of Emerald ash borer in Minnesota and Wisconsin. 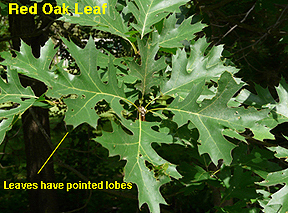 The white oak has rounded lobes all around its leaf. The white and bur oak are majestic trees found in northern forests. They are closely related trees and have leaves with rounded lobes. 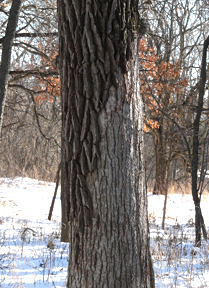 A “patchy” bur oak with smooth bark fungus. 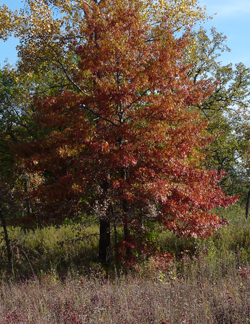 In October, white oak leaves turn a beautiful wine red color while the bur oak leaves turns brown. The white and bur oak bark is susceptible to smooth bark fungus and may look patchy in appearance. 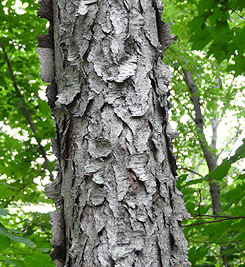 Smooth bark fungus has not been reported to damage the tree, although it does effect the outer bark of the tree. Oaks produce acorns for seed. Some years the crop is bountiful, and other years there are none. Less than 20% of the acorns are viable to produce trees. Acorns provide food for many types of wildlife including squirrels, deer, birds, and mice. The red oak is a majestic tree that lives in Minnesota forests. The “Big Woods”, which once covered much of Central Minnesota before settlers moved in, was made up principally of red oak and sugar maple. Red oaks are slow growing trees that live up to 300 years. It is called the “red oak” because in the spring the leaves are red when they first emerge. In the fall, the leaves turn a beautiful maroon red. Red oak bark is rough and thick. 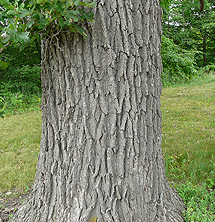 Red oaks have pointed-lobed leaves and the bark is thick and rough (alligator bark tree). In the fall, many types of animals gather and eat its acorns including: deer, squirrels, chipmunks raccoons, crows, and jays. The acorns are rich in fat and allow animals to prepare for the winter. 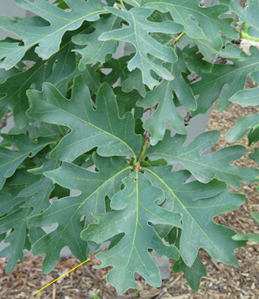 Red oaks are an important shade tree, as well as being a valuable timber tree. Flooring, cabinets, and furniture is made of red oak wood. 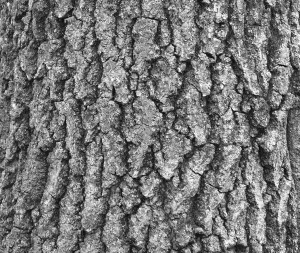 Oak wilt is the most destructive disease that red and white oaks can get. It is caused by a fungus and red oaks are more susceptible to oak wilt than white oaks. 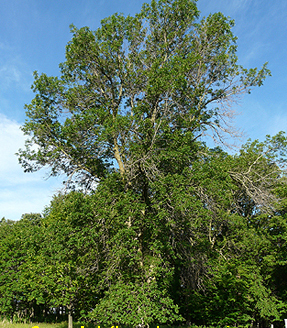 An entire neighborhood or forest can lose its red oak population to this disease. 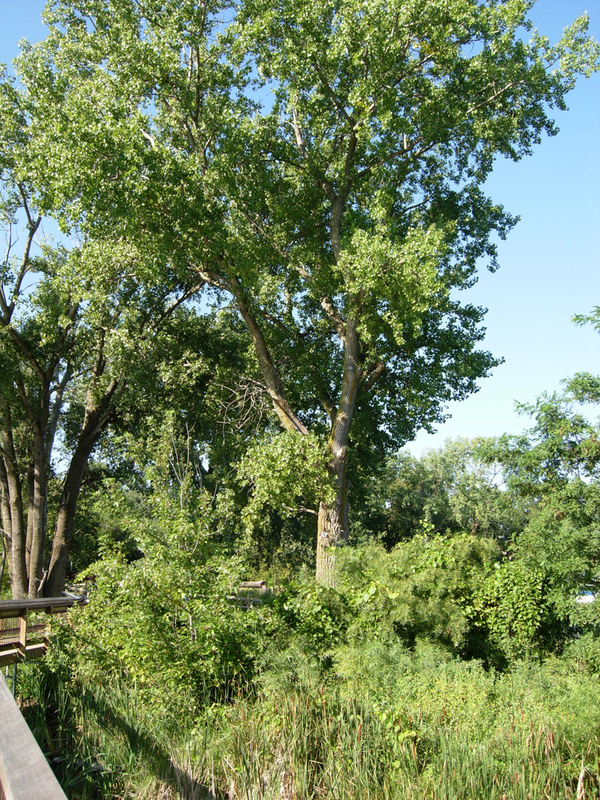 Cottonwoods are the largest trees in Minnesota growing up to 100 feet tall, and the trunk may be greater than ten feet in diameter. 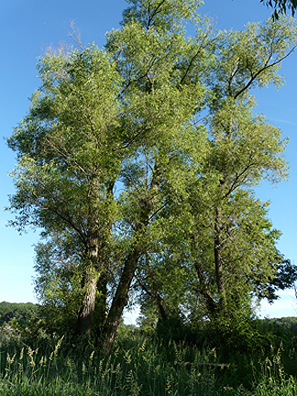 Cottonwoods like to grow near water, but are also found in backyards and in open areas. It is a fast-growing tree and its lifespan is short. A 75 year old tree is an old tree. The Minnesota “champion” cottonwood has a circumference of 394 inches. The wood is brittle and soft and breaks easily in windstorms. 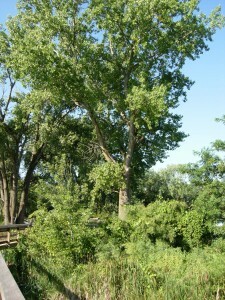 But cottonwoods are a great shade tree, providing relief from the sun on a hot day. 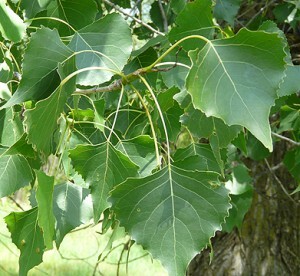 The leaf of a cottonwood is triangular-shaped. The leaf stalk is flattened and flexible, causing the leaves to rustle in the slightest breeze. It makes a wonderful “whispering” sound when the wind is blowing and for this reason it is sometimes called the “whisper tree”. 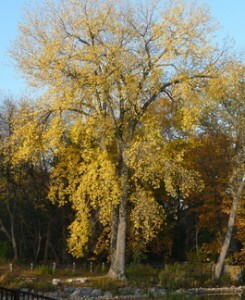 Native Americans considered the cottonwood sacred. The Sioux ceremonial Sun Dance occurred around small cottonwood tree. 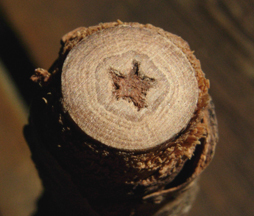 Also, if a branch is cut crosswise through a growth scar, it reveals a five-pointed star. 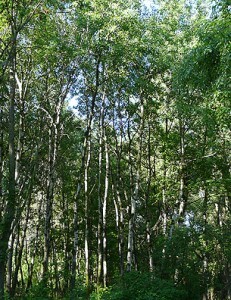 Cottonwoods are very vulnerable to fire and drought. 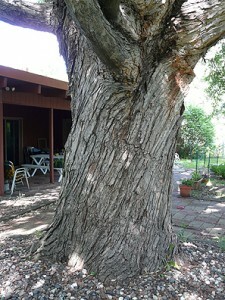 A fire that damages the bark on older trees, can open a cottonwood up to decay. A long dry spell can lead to death of trees that are not near rivers or lakes. Cottonwoods get their name from the seed which is encased in a “cotton-like” material and is found everywhere during early June. During the summer of 2009, the cottonwood seed blew around for six weeks. Many people dislike cottonwoods because of the seed problem, but as you can see cottonwoods have many positive qualities. 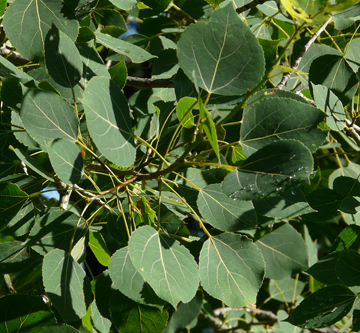 Quaking aspen are closely related to cottonwood trees. The two species have flexible leafstalks that rattle in a slight wind. The leaf of the aspen is round and the size of a silver dollar. Aspen have been sometimes called the “silver dollar tree” or the “singing tree” because of the beautiful sound the leaves make in the wind. 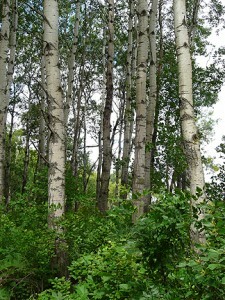 The bark of a quaking aspen feels smooth and has a greenish tinge beneath the white bark. There is chlorophyll in the bark and the tree photosynthesizes (makes food from the sun’s energy) even in winter when its leaves are off. It is unfortunate that some humans use this tree to carve their initials in the trunk, scarring the tree for life. The quaking aspen is a “pioneer” species, moving quickly into clear cut (where trees are totally logged out) or fire damaged areas. They spread by seed and suckers from the root system. A single tree can create “clones” that emerge from the roots. Even though an aspen tree may live for only 50-60 years, its clones can produce many generations of trees that live for 100s of years. Pulp from aspen trees is used to make paper for books and magazines. Many animals use the quaking aspen including beaver, bear, deer, snowshoe hare and ruffed grouse. Sugar maple in summer. Notice the “egg-shape” of the canopy. 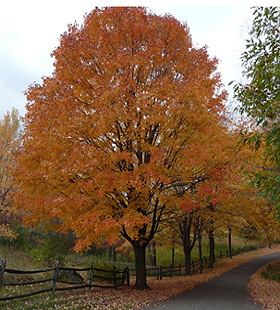 The sugar maple is a favorite Midwestern tree. It is known for its beautiful color in fall, and for maple syrup . Our neighbor to the north, Canada, has adopted the maple leaf as its national symbol. 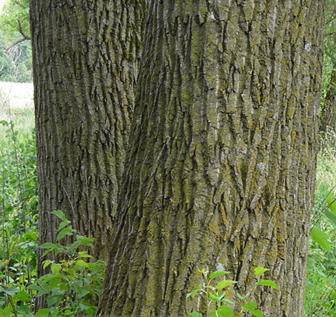 Sugar maples are found in mature forests (over 100 years old ) with basswood and red oak. Before settlers moved into Minnesota, a huge maple-basswood forest, called the “Big Woods”, extended from St. Cloud through the Twin Cities, and all the way to Mankato (a distance of 130 miles). Unfortunately, this great forest was cut down by the 1860s and the wood was used to build homes and firewood. Today less than 1% of the original Big Woods forest remains in Minnesota. Maples have beautiful winged seeds that are often called “helicopters”. The seeds whirl in the wind, and settle far from the “mother” tree. Sugar maples are slow-growing trees and live up to 300 years. Maple trees are used for cabinetmaking, flooring and even violins. Sugar maples are valuable to wildlife too. Deer feed on young seedlings and the buds during winter. 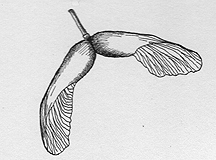 Many animals eat the winged seeds. Holes in older trees provide homes for squirrels and many types of birds. 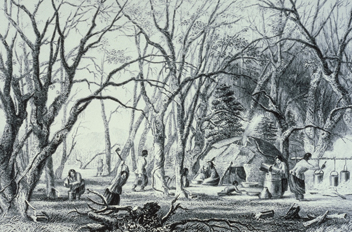 Native American syrupping camp (Minnesota Historical Society). 1 gallon of maple syrup. Over a million gallons of syrup is made each spring in the United States. Maples were “tapped” by Native Americans for hundreds of years before they taught white settlers. Native Americans captured the sap in birch baskets. Then they boiled the sap down by heating rocks and putting them into the sap-filled basket. 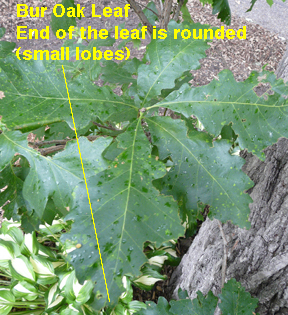 The lobes of the sugar maple are not deeply cut like the silver maple. Silver maple leaf with deeply cut lobes. 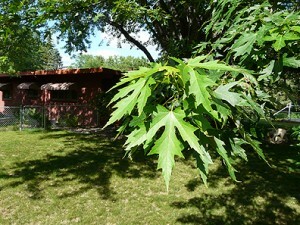 The silver maple is a fast growing tree that is commonly planted in neighborhoods. They grow up to 90 feet in height, but the branches easily break in a strong wind. Silver maples are considered a “soft maple” because the wood is not as hard as a sugar maple. 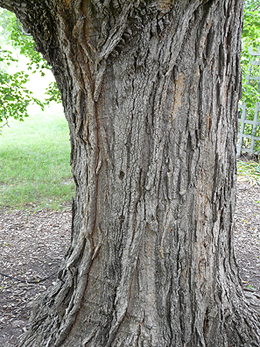 The bark has a flaky appearance and the roots are shallow, often extending above the ground. A silver maple growing in the flood plain of the Mississippi River. Notice the high water mark 4 feet above the ground. 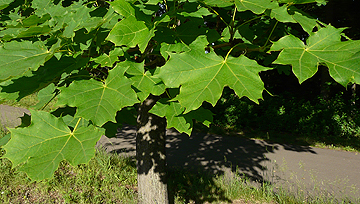 In nature, silver maples grow in flood plains near rivers and lakes. Silver maples are able to withstand flooding for several weeks with no damage. The back side of the leaf is silver and when the wind blows, it gives the tree a silver texture, thus the name, silver maple. In the spring the silver maple is one of the first trees to bloom and attracts many bees for pollinating. As a result, there is always a good crop of helicopters (winged seeds). These seeds are relished by birds and small mammals. Black willow grows next to marsh lands. Black willow like to have their roots near or in the water. For this reason, willow are indicators of water, even if there doesn’t appear to be any water present. They are a fast growing tree and their twigs break easily in the wind. Broken willow twigs grow if they are in the ground and water is near the surface. This provides a way for new plants to get started. 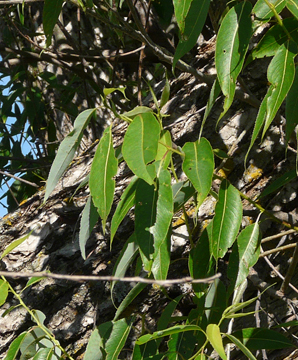 Black Willow is know as the aspirin tree because willow bark is a natural form of aspirin. Native Americans took willow bark to reduce pain. The leaf of the willow is long and narrow and for this reason it is sometimes called, “arrowhead leaf tree”. Willows are an inspiration to many people because they are so flexible. There is a saying that during hard times, ” It is best to be like a willow and bend but not break.”. 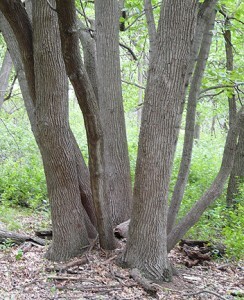 A basswood with multiple trunks. 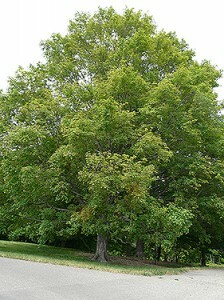 Basswood or American linden grows in rich moist forests, usually in the company of sugar maples. Basswood get up to 125 feet in height and grow at a medium-fast rate. A linden will live up to 200 years and they have been called the “tree that never dies”. 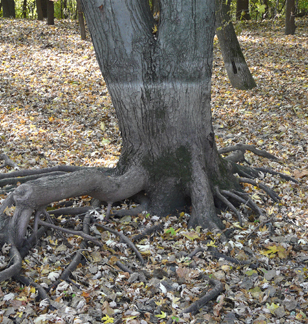 If a basswood tree is injured or dies, sprouts grow from the base of the trunk and later produce a tall clump of trees around what was the original tree (see photo to the left). They are fast growing trees and the soft wood is used by woodcarvers and furniture makers. 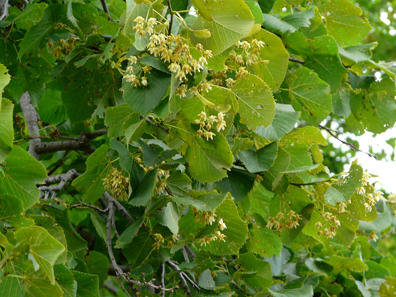 In early spring, the young shoots and leaves of the linden were used in salads for hundreds of years. 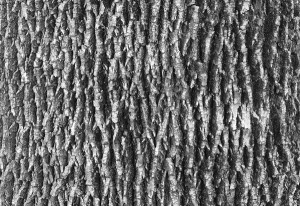 Also, the inner bark of the basswood was the main material used by Native Americans and Europeans to make ropes, string, and nets. The leaves are large (up to six inches) and rounded. It has sometimes been called the “toilet paper tree” because of its large leaves. In late June, the basswood flowers adorn the tree. The smell of the basswood flowers is fragrant and hundreds of insects come to pollinate the flowers. Naturalist Jim Gilbert says in his nature notebook, “On a calm day the buzzing of the wings of the bees makes a humming noise that can be heard from a great distance.” The flowers can be picked and dried to make a soothing tea that has a beneficial effect on the blood, helping to reduce cholesterol as well as high blood pressure. Boon and Groe, Nature’s Heartland. Ames, Iowa. Iowa State Press, 1990. Fergus, Charles, Trees of New England. Guilford, CT. Globe Pequot Press, 2005. Gilbert, James, Jim Gilbert’s Minnesota Nature Notes. Minneapolis, MN. Nodin Press, 2008. Gilbert, James, Jim Gilbert’s Nature Notebook. Chanhassen, MN. Minnesota Landscape Arboretum, 1983. I have a cane that I was told ,was made from a limb of a diamond elm tree. it was given to me in Minnesota. I would like information about this tree which I have not found on this website. The cane has caused much interest as I use it. thank you. Maybe it’s a flame willow? Those stay red and can grow near water. If it’s a shrub, perhaps a red twig dogwood? How do you grow Quaking Aspen’s from the seeds? Or do they have seeds from which one can start them?